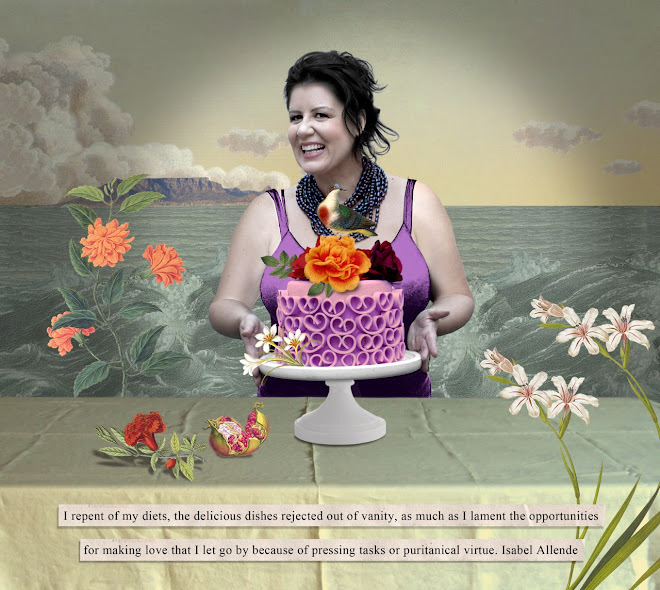 I wrote of my affection for avocados in the October 2012 issue of Woolworths Taste. In it I confided how much (and how) I liked to eat them and of how intensely Jacques disliked them. And then I thought no more about it, other than smirking when Jacques told me that his colleagues wanted to know how he could possibly claim to despise avocados while quite happily eating guacamole. ( You see what I'm dealing with?) 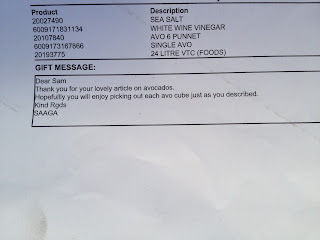 And then, out of the blue, I received an email from the South African Avocado Growers Association thanking me for writing such nice things about their fruit and asking for my adress as they'd like to send me something. 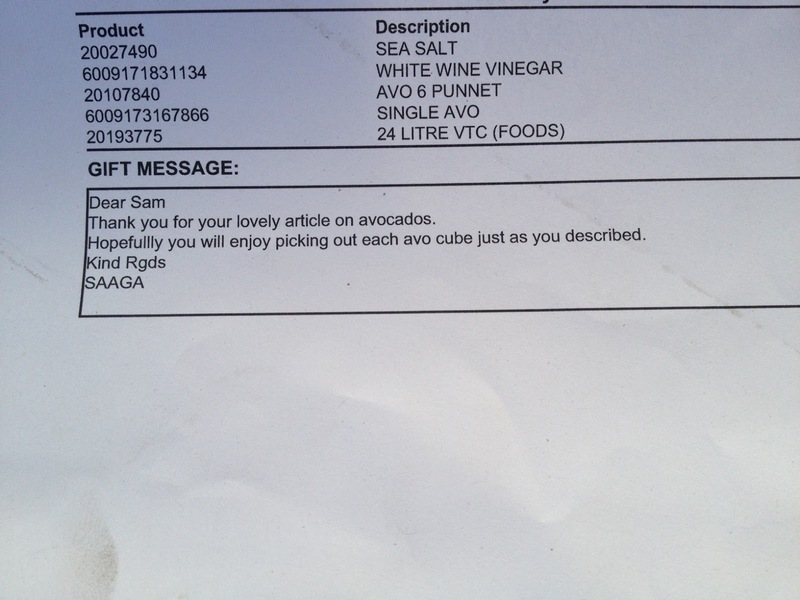 Which is how I came to be in possession of a dozen avocados, a bottle of white wine vinegar and some sea salt and this rather lovely note, which said that they hoped I would enjoy picking out each avo cube just as I'd described in my column. I cannot begin to tell you how much this gesture pleased me. 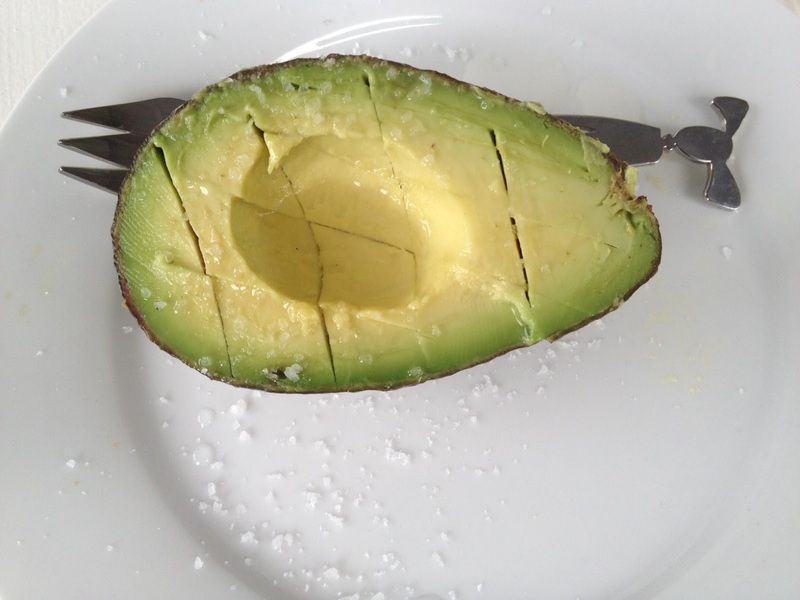 Such kindness could only come from people who truly, truly loved avos. We are so lucky in our avos here in SA. Until I came here I never really experienced how creamy and delicious they could be. In England they never really get ripe before they go black and mushy. Love eating them scooped from their skins with a dash of balsamic vinegar and salt or mashed on toast with marmite. Avo, avo and more avo makes me so happy! Okay, I have a brother that Jacques should meet - he hates avo and won't even eat lettuce if it has had a piece of avo on it - but guacamole is fine! Is this a strange kind of unusual man gene? Mrs Jones! How strange are the men in our lives? Avo= Guacamole! Writing is one One Elle-of-a Thing. Simple & Delicious. That's The Way I Like It.